BANDO 85J4 Urethane Poly V Belt | 85-J4 Micro V Belts | Metric PJ216 Motor Belt | 8.5 inch Ribbed Belt (216mm) Length, 4 Ribs. Home > Heavy Duty V Belts > Poly-V Ribbed (Micro -V) Belts > J, PJ Section Poly-V (Micro V) Belts - 3/32" Rib Width. > 85J3 Polyurethane Poly-V Belt, Metric 3-PJ216 Motor Belt. 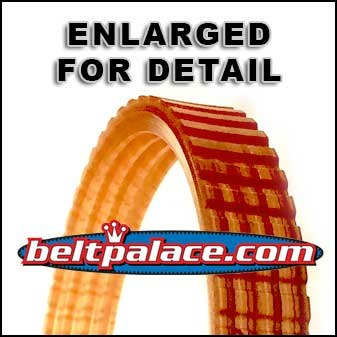 > 85J4 Urethane Poly-V Belt, Metric 4-PJ216 Drive Belt. 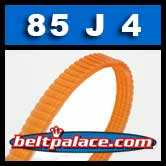 85J4-U (Orange Urethane) Poly-V rib belt. 4 Ribs. 8.5” (216mm) Length (Physical OC = 8-7/8") - PJ216 Metric belt. BANDO USA “J” Series Poly-V (Micro V) ribbed belts are designed to replace OEM belts on extra heavy-duty applications such as 85J4 sander/planer belts, compressor belts, 85J4 (4-Rib PJ216) fitness drive belts, and electric motor drive belts. AKA: J4-85 Belt. Replaces F-20A Electric Planer Drive Belt for Hitachi Models. Harbor Freight/Chicago Electric Planer Model# 32222 Ribbed belt. (Tight fit). Central Machinery Model 32222 drive belt. Drive belt for Power Fist electric hand planer Model 8088403 (5.5 amp, 20 V) as sold from Princess Auto (Canada). Metric Poly V: 4-PJ216 (4/PJ216). (SMALL) BLADE DRIVE BELT for Delta/Buffalo Planer Model QL6014. 85J-3 Poly-V (3-PJ216) Belt. 8.5” Length. 85-J Section Motor Belt replaces fitness belts, compressor belts, drive belts, and (shiatsu) massage chair motor belts. 85J3 Micro-V Belt.